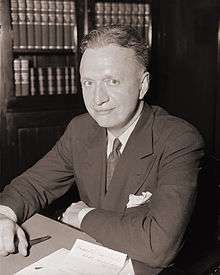 Francis E. Walter as he appeared as a young Congressman in 1939. Francis Eugene Walter (May 26, 1894 – May 31, 1963) was a Democratic member of the U.S. House of Representatives from Pennsylvania. Walter is best remembered as a prominent member of the House Un-American Activities Committee from 1951 through 1963, serving as chair of that committee for the last nine of these years. Francis E. Walter was born in Easton, Pennsylvania. He attended Lehigh University, George Washington University and Georgetown University. During both World Wars I and II he served in the air service of the United States Navy. He was the director of the Broad Street Trust Company in Philadelphia, Pennsylvania, and of the Easton National Bank in Easton. From 1928-33 he was the Solicitor of Northampton County, Pennsylvania. He was a delegate to the 1928 Democratic National Convention. He was elected as a Democrat to the 73rd United States Congress and served until his death in Washington, D.C.
Walter is best known for the McCarran-Walter Act, passed over President Truman's veto in 1952, which, while it opened naturalization to Asian immigrants for the first time, continued the immigration quota system based on national origin introduced in 1924, and allowed the U.S. government to deport and/or bar from re-entry those identified as subversives, particularly members and former members of the Communist Party. In 1944, he presented President Roosevelt with a letter opener made of an arm bone of a fallen Japanese soldier. Walter's views were regarded by some as "reactionary and racist". A staunch anti-Communist, he served as chairman of the House Un-American Activities Committee during the 84th through 88th Congresses. Walter also served as a director of the Pioneer Fund, a foundation best known for its advocacy of IQ variation among races. Walter appeared in a central role in the 1960s-era U.S. government anti-Communist propaganda film Operation Abolition. Historical footage of Walter also appears in the 1990 documentary film Berkeley in the Sixties. He died in 1963, aged 69, and was interred at Arlington National Cemetery. ↑ James J. Weingartner, "Trophies of War", Pacific Historical Review, 61, 1 (1992), pp. 54-67, 60-61. ↑ Roger Daniels, Guarding the Golden Door: American Immigration Policy and Immigrants since 1882 (Boston & New York: Hill and Wang, 2004), p. 129.
Letters to Francis E. Walter. Available online through Lehigh University's I Remain: A Digital Archive of Letters, Manuscripts, and Ephemera.